Rob Winch passed away 8th August 2012 from infection complications after receiving a bone marrow transplant for leukemia. Most will remember Rob from his days playing with Tamburlaine, Streak, The Heartbreakers, The Country Flyers, the 1860 band, the Rodger Fox Big Band and most recently his jams down at Wellington's Bristol Blues Club. He was also a very successful composer writing and producing countless commercials, film scores and television soundtracks. There is a bio on Rob's website http://www.robwinch.com/,which gives a great rundown on the career of this deeply talented and kind hearted person. I feel like I’m the last person to hear the sad news of Rob’s passing. I’d like to write a tribute to him. However, I think I need to provide some context. I’m talking about two intense years as 11 and 12 year-olds during what was arguably the early days of the best music ever. In 1964, as an 11 year-old, I started at Northcote Intermediate School on Auckland’s North Shore. Coming from the tiny semi-rural Greenhithe School where I knew everybody, it was quite a shock for a shy, creative bookworm to land in this big suburban school. In those days, we sat tests in the final weeks of Standard Four, the results of which determined our class placements at Intermediate. I found myself in an experimental class of bright pupils with a great teacher who was given the task of extending us in preparation for high school. Almost as if we knew we were different, we quickly made friends and formed allegiances within the class. One of my early friendships was with Mike Trent, a talented young musician who played guitar. I watched him and a lightbulb went off in my head. I had been given some early piano lessons from my grandmother. Dad played piano in a dance band, and his father played accordion, violin and harmonica. My only musical skill at that time was a good ear. I knew the guitar was for me. 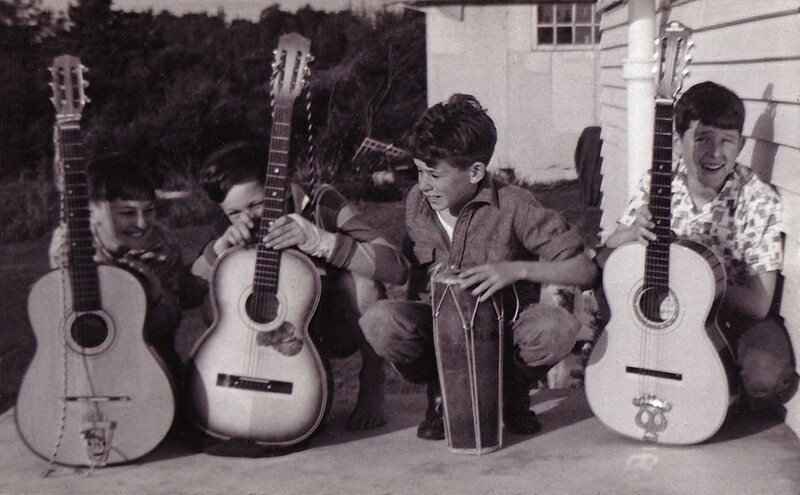 Mike showed me the basic chords, sold me his old guitar and we joined the school orchestra. Shortly after that, Rob joined Mike and I, and a fourth classmate, Richard Wintle, acquired some bongo drums and we were officially a band! From memory, Rob was starting from scratch too, but I guess with Martin at home, they must have acquired some real synergy, especially with a bit of brotherly competition thrown in. We all picked up songs very quickly and competed to introduce and teach each other new material. Naturally, we listened to what was on the radio, and for us, it was the Beatles and mostly English bands we liked. We sang lyrics from memory, and now and then, were able to buy the then-popular small songbooks with current lyrics. I don’t recall having any sheet music or chord charts, so we played songs until we agreed we had the correct chords. No internet lyrics, chords, or YouTube “how to play” videos back then. Many, many lunchtimes were spent learning more chords, real songs and giving impromptu concerts. I knew that Rob was “a Pom” and that his family had recently immigrated to NZ. I stayed at his house one weekend and realised in retrospect just how “alive” the memories of WW2 were for them still. Although my local experience was just as real, I later learned how differently the two countries experienced the war. Most of the men in my life had either seen service in one or both of the world wars, or lived through them. The women too, had powerful memories of family loss and social survival. The comics and books we read were still full of war stories and imagery. Some of the popular movies had war-related themes. We played war games all the time. My father churned out wooden guns for us. Several times over our two years at Intermediate, Rob, Mike and Richard came to stay at our place at Greenhithe. We had five acres of paddock and bush adjoining fifty acres of the neighbours’ property. We played war from dawn ‘til dusk. I still have an odd-shaped collarbone from being “bayonetted” by Rob during one particular game. At night we played music. Wonderful, innocent times.